Home News First Trax IT’S MARCH 1ST AND THANKGIVING – AGAIN. IT’S MARCH 1ST AND THANKGIVING – AGAIN. First – it’s SNOWING again here at Snowshoe Mountain which will make for some awesome First Tracks for our crew. I’m PLANNING on doing some drone video if the winds are not too strong. We’ll see. Check the snow report for all the deets…I’m headed to the slopes to do some First Tracks with 15-20 friends. Thanks to Snowshoe. I’ve been doing SkiNC and SkiSoutheast.com for 18 seasons now. I had a small ski website running at www.appnetsite.com/skiing in 1996-1997 but I really don’t count those years as (like everyone back then) we were feeling our way around the WWW at that time. The website has always been a “hobby” of sorts and certainly a passion of mine. I might have started it and I guess that makes me the founder and owner. However THE REAL OWNERS of SkiNC and SkiSoutheast are those souls that I got to hang out with on Saturday. I might have “turned the key” that started this little “machine”, but the real stars – the people who are TRULY more important to the website – is that corp group of roughly twenty people who I was able to hang with – even for a short bit of time on Saturday. I don’t want to list all 15-20 names because you guys know who you are and I don’t want to screw it up but leaving even one of you guys out. I don’t think I’ll offend anyone by mentioning the two real VIPs of the group and the website. jeffryc and pink. Jeff and Frances are the real ambassadors of SkiNC and SkiSoutheast.com. Those two have logged more time talking us up than I have. They’ve certainly introduced more people to the website (face to face) than I probably have. As I was hanging out and speaking with some of Snowshoe’s staff on Saturday…I couldn’t help overhearing numerous conversations that the corp members of the website were having amongst themselves as they were sharing stories and talking about all of the experiences that they’ve had. It made me equally proud…and even a little jealous. As I was typing this up on Saturday evening my thoughts turned to Hoots over at Top of the World where – AT THAT TIME- several SkiNC / SkiSoutheast-ers were doing karaoke. I should have been there. They were over there making memories – again. The truth is I salute each of those corp group of skiers, snowboarders and snow loving souls. I love this stuff…but I’m not worthy of their kind of commitment to life on the snow as those people live it. I was hanging with davidski for a bit and the son of a gun was sicker than sick – running 102° temp earlier in the day and yet there he was hanging with us at the wine and cheese event – both to support me and the website – and to hang with those he calls his closest friends. I’d have been in bed, hugging the covers. Here David was chillin with friends…before heading over to Silver Creek to make some more turns. Hanging out with these people on Saturday inspired me. It’s doubtful that I can ever quite live up to their kind of commitment to being on the snow. But I’m going to try a bit harder. “My real job” and life-in-general has gotten in the way from time to time. Those are only excuses. So THANK YOU SKINC / SKISOUTHEAST. When I say that…by now I hope that you understand that I am thanking YOU, Jeffry, Frances…and all of the rest of you. You know who you are and I appreciate you guys a ton. I’m betting those words could easily sum up YOUR “story” if you were one of the fortunate ones who skied or snowboarded at ANY ski area in the Southeast and mid-Atlantic on Saturday. Pick a resort and if you happened to be visiting it on Saturday – it was awesome, beautiful, impressive, magnificent, stunning, wonderful, and even breathtaking at times. Insert your own adjective. The day started out cold and while it stayed brisk…the sun shone so brilliantly that it was comfortable on the slopes all day long. The weather was just about as good as it can get on the mountain on Saturday. However, what stole the day were the conditions on the snow. I doubt it was much different wherever YOU guys and gals chose to ski or ride on Saturday. All that I can report on is what it was like here at Snowshoe Mountain. The day began with flawless corduroy. All I can say is that every mountain, everywhere should groom and maintain snow the way that they do at Snowshoe. I’ve skied awesome conditions at every resort in the region. There are days when every resort gets it right. 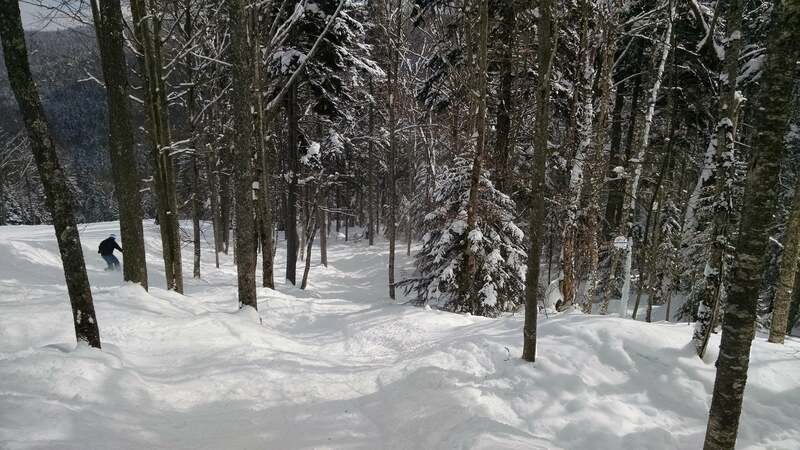 However I would extend a friendly challenge to every resort in the region that they should aspire to “getting it right daily” the way that Snowshoe’s peeps do. The snow was flawless and I want to thank our Snowshoe hosts who made us feel very welcome here at the SkiSoutheast.com Summit. 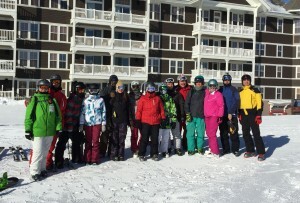 We met up with the “Corp SkiNC/SkiSoutheast-ers” on Saturday morning. I had the pleasure of doing breakfast at The Junction with many of them. Then we met up with many more at 8:45am and got a nice group photo and then did a few turns down the main trails to Ball Hooter. As usual, the first hour or so was awesome just making laps right to the lift and up and down the hill. ALSO as usual…by 11am the slopes were full and the lift lines began to back up – although I never waited more than 13-15 minutes with the exception of at Ball Hooter at the end of the day – heading back in. I and my crew always make as many turns as we can until around 11am and then we head in for a bit, do lunch and then hit the mountain again around 2pm. That peak period – from 11am-2pm – is when everyone who IS going to ski or ride will do so. Most people don’t have a clue about how great the hill is from 9-11am and from 2-3:30pm or so. On this particular day I made some 12-15 trips down numerous trails and at the end of the day we headed over to Cupp and Shays. Both trails were pretty “scraped” at that point. Lower Shays had no moguls – which was the first time I’d seen Lower Shays with no bumps in a few years. It was fast, to say the least. We had plans to meet Snowshoe’s Marketing Director, David Dekema at the new Corduroy Inn at 5pm so we called it a day and went in and showered up for some Complimentary Wine & Cheese. I want to thank David, Erin Stolle (Snowshoe’s Director of Sales) and their entire crew. It was great meeting both of them for the first time. As is always the case when you’re talking with ANY Snowshoe rep – you can feel their passion for the mountain and the industry as a whole. This is David and Erin’s 3rd season at Snowshoe and it was great talking with them and hearing some of their plans…as well as some of the short and long-term plans for the mountain. My buddy (and Snowshoe Vice President), Ed Galford came by for a bit and hung out. He and his crew are making it possible for us to do First Tracks on the Soaring Eagle side of the mountain on Sunday morning. That is a special privilege offered to only a select few and we’re so appreciative of the fact that these guys do this for us each season. 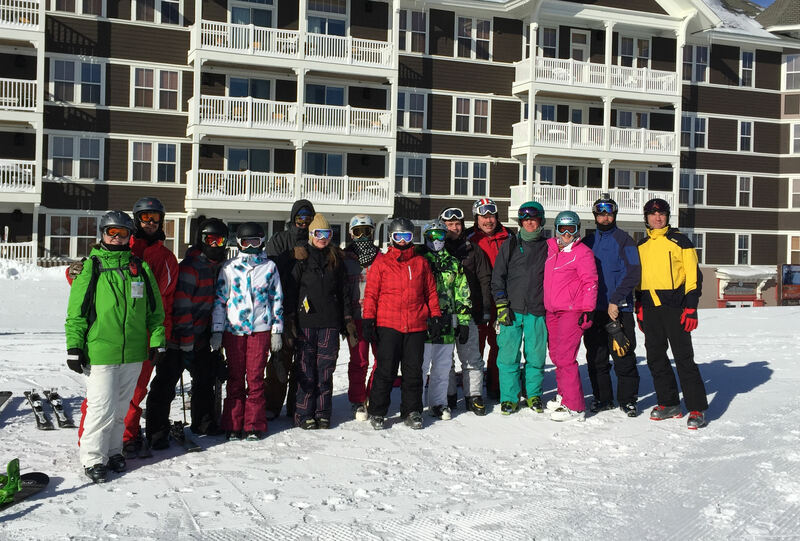 Thanks to all of Snowshoe’s team for being such awesome hosts. While the weather and the day was perfect…those guys and gals really know how to show people a good time…and THAT made it one of those special days to remember. Next articleSkiSoutheast Summit First Tracks at Snowshoe was Snowy and Awesome!